Benjamin Hall, born in Golcar, joined Prices 14th Foot Regiment and fought at Culloden. He was a Captain in the 62nd Regiment in 1760 and then Steward at Wentworth House. Dublin, Feb. 24. This evening his Grace the Lord- Lieutenant received the following letter from Major- General Strode, dated at Belfast, Feb. 23, 1760, at six in the evening, viz. "Information of Benjamin Hall, lieutenant and adjutant of my regiment, who, this moment, arrived here, on his parole, from Carrickfergus, in order to get provisions for the officers and soldiers of my regiment there, says, that on the twenty-first instant, three ships appeared off the isle of Magee, standing in shore, for the Bay of Carrickfergus; and at eleven o'clock came to an anchor, about two miles and a half to the north-east part of the castle, and within mus- quet shot of the shore at Killrute-point. At this time the small number of troops belonging to the garrison were at exercise, about half a mile on the road to Belfast; and at a quarter after eleven o'clock, the guard was turned out, made up, and marched off, to relieve that on the French prisoners in the castle; the rest of the men continued in the field of exercise, where an account was soon brought, that the three ships, just come to an anchor, had taken and detained two fishing boats, and, with them and several others, were plying on and off betwixt the shore and the ships; on which immediate orders were sent to the castle for both guards to continue under arms, and double Gentries over the French prisoners, and be particularly strict and watchful over them, till such time as they could be satisfied whether they were friends or enemies; though, at the same time, a strong report prevailed with some, that it was an English frigate, and two store-ships: but to be convinced what they were, after the troops had assembled in the market-place, the said Lieutenant Hall, went off with a reconnoitring party, and took post on a rising ground, where he could plainly perceive eight boats landing armed men, and that they drew out in detachments, and took post on the dykes, hedges, and all the rising grounds, from whence they could have most extensive views; upon which he gave the necessary orders to his non-commissioned officers and men, to have a watchful eye of their approaches, and to take particular care they did not get round them, by going at the foot of the hill undiscovered: in order to prevent which, he posted them himself, and told them, as soon as ever the advance guard came within shot, to fire at them, and continue so to do, until they repulsed them, or if necessitated, to retreat, he likewise pointed that out to them, with orders to take every opportunity, on advantage of the ground, in their retreat, to retard the enemy's approach, and to be sure to keep a communication with the town as much as possible; and on this he immediately went to the town, and acquainted Lieutenant Colonel Jennings, where he found him with the troops on the parade, who immediately ordered detachments to be made to defend the gates of the town, and all the avenues leading thereto. Soon after which the reconnoitring party retired, after having spent all their ammunition; during which time, the Lieutenant Colonel and chief magistrate of the town, sent off the sheriff, and Mr. Mucklewaine, (who is captain of the militia of the corporation), with orders to take off the French prisoners of war, and convey them with all speed to Belfast, where they were to receive further orders from me. By this time the enemy were in full march for the town, which he computed to be near one thousand men; and two or three straggling hussars, on horses they had picked up after landing, attempted to enter the gates ; but on the first fire retired, but were soon supported by parties of foot, who attacked both the North and Scotch gates, as also the garden walls of Lord Donnegall, who were repulsed also, and kept back as long as the men had ammunition ; on which Colonel Jennings ordered the whole to retire to the castle; which he had sufficient time to do, as at this time the enemy was a little checked from our fire; and would have been more so, had the men had ammunition. Before the gates of the castle were shut, they made their appearance in the market-place; and then it was in his opinion, the destruction of the enemy would have commenced, had it not been still (he begs leave again to observe) the then dreadful want of ammunition, notwithstanding the supply of powder they had a few days before, from Belfast, by my order, but were in want of ball, and even time, if they had that, to make them up; from which the enemy, finding our fire so cool, attacked the gates sword in hand, which, from the battering of the shot on both sides, the bolts were knock'd back, and the gates opened, and the enemy marched in; but Lieutenant Colonel Jennings, Lord Wallingford, Captain Bland, Lieutenant Ellis, with some gentlemen, and about fifty men, repulsed the enemy, and beat them back. Here it was he saw great resolution in a few Irish boys, who defended the gate, after it was opened, with their bayonets; and those from the Half moon, after their ammunition was gone, threw stones and bricks. Had this attack of the enemy been supported with any degree of courage, they must certainly have succeeded in it, but they retired back under cover, leaving the gates open with our men in the front of it, which gave them a short time to consider what was the best to be done; first to see the men's ammunition, which, if they had had any, would have certainly sallied, and even so without it, had not Colonel Jennings, and all the officers thought the enterprize too hazardous. Then they considered, if the gate could be defended, the breach in the castle wall could not, it being near fifty feet long; and having but a short time to deliberate, all agreed a parly should be beat, and Lieutenant Hall sent out to know on what terms they might surrender; which was accordingly done; and on his going out, found the greatest part of the enemy under shelter of the old walls and houses before the castle-gate; and after the usual ceremony, demanded of the Commandant, (the General being wounded), what terms would be given the troops on their surrender, and at the same time sent the drum to call Colonel Jennings out of the castle, in order to treat with the French Commandant on articles of capitulation, which, he says, as well as he can remember, were as follows: viz. Colonel Jennings demanded, that the troops should inarch out with all the honours of war, and the officers to be on their parole in Ireland, and not be sent prisoners to France; the soldiers also to stay in Ireland, and that an equal number of French prisoners should be sent to France, within one month, or as soon after as ships could be got ready for that purpose. Granted. That the castle of Carrickfergus should not be demolished, or any of the stores destroyed or taken out of it. Granted. That the town and county of Carrickfergus should not be plundered or burnt, on condition the mayor and corporation furnished the French troops with necessary provisions. Granted. This, as well as he can remember, was the verbal articles agreed on, though on writing them, the French Commandant, after consulting his principal officers, declared he could not by any means, answer to his master, the French king, granting to his BritanicMajesty the stores in the castle, which he insisted upon; and Colonel Jennings, to his great grief, had it not in his power to refuse, declaring solemnly, at the same time, with a grave countenance, that he had rather have been buried in the ruins. To which the French Commandant replied, that he could not insert it in the articles of capitulation, yet he would give his word and honour, and did so, that if there was nothing of great value in the castle, belonging to the king, besides powder, he would not touch it, (which there really was not) but how far he will keep his promise is not yet known. Likewise the magistrates of Car- rickfergus, not furnishing the French with necessary provisions, they plundered the town, declaring it was their own fault, as they were convinced they had it in their own power to supply them, as they had found enough in the town afterwards. Mr. Hall further informs me, that he has discovered by some of the French, there was a disagreement betwixt their General and Captain Thurot, the General being for the attack of Carrick, and Thurot for landing at the Whitehouse, and attacking Belfast. He likewise judged the frigates to be, one of forty guns, the other two about twenty each. Lieutenant Hall begs leave to present his duty to your Grace, and hopes your Grace will excuse any inaccuracy that may be in his description, as he was no ways provided with any papers, but his memory, and often interrupted by numbers of gentlemen of the militia, who were crowding perpetually in the room to receive orders. Will. Strode. Belfast, Feb. 23, 1760." he was put upon the half pay list of his rank - a Captain in the army. From that time Captain Hall was destined to act in a new situation. to the employed while he did justice to the employer. made chargeable to and with the payment thereof. Goebars set in pearl ornamented with Brilliants. nephew Joshua Briam his executors and administrators. of October one thousand eight hundred and two. 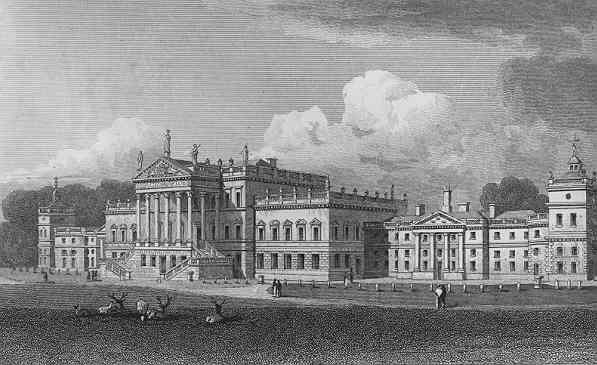 There is a long series of letters from John Carr (an architect who designed many buildings at Wentworth) to his friend Benjamin Hall, the steward at Wentworth House, among the Fitzwilliam Papers in the Sheffield Archives. There is a also a letter from Benjamin Hall, Wentworth to Fitzwilliam dated the 29th Jan 1803 concerning the amount of wine in the cellars and thanks for donations to 2 collliers injured in pits. Ref WWM/F/106/97, held at Sheffield Archives.